Could You Be the Answer To Someone’s Prayer? Two weeks ago, I was preparing for an upcoming trip to El Salvador with Compassion International and my ministry partners, Gwen Smith and Mary Southerland. We were going to visit several projects in three different cities to get a better understanding how Compassion breaks the cycle of poverty among some of the world’s poorest populations. Like the smell of approaching rain on a summer day, I sensed that God was about to do something amazing. With the anticipation of a child on the eve of her birthday, I suspected God had a special surprise for me in this little country sandwiched between the two continents. Several years ago, while speaking in South America, someone had given me a beautiful Bible with my name engraved on the blue leather cover. It was in Spanish. I don’t speak Spanish. “Take the Bible,” God seemed to say as I packed my small carry-on. We arrived in El Salvador late Monday night and joined our Compassion team. “Will we have the opportunity to sponsor any children while we are here?” I asked Justin, our trip coordinator. He handed me 5 packets with pictures and descriptions of 5 El Salvadorian children who were living in poverty. A precious tiny girl dressed in pink. A cute little princess dressed in blue. A pair of huggable young boys. And Miquel…a teenage boy. He seemed out of place in this batch of elementary age urchins…a bit uncomfortable having his picture taken by the concrete wall. “Is it more difficult for teenagers to find sponsors?” I asked Justin, while never taking my eyes off of this soul wrapped in teenage awkwardness. I clung to the packet and pressed it to my chest…letting his name roll off my tongue and into my heart… Miquel. The next day, someone brought a surprised and confused Miquel to the project I was visiting. He had had a sponsor in the past, but for some reason they had to discontinue their financial support. He wondered why he was at the center, and sat with the translator to get his answer. “How did you feel when you lost your sponsor?” the translator asked. “I was very sad,” he explained. “Did you pray for another sponsor?” she continued. I went out to meet Miquel. I explained that God had told me about him before I even came to El Salvador. While he was praying, God was answering his prayer. I told him that God had seen him, that God knew him, that God was providing for him, that God loved him…and so did I. I handed him the Bible with my name engraved on the front, and his name written on the inside cover. He was my miracle, and I was his. Compassion International strives for every child to be SEEN, to be KNOWN, and to be LOVED. And when you stop and think about it, isn’t that what we all long for? The woman across the street. The child in the homeless shelter. The man on the park bench. The teenager dressed in Goth. The woman reading these words. Oh dear friend, God sees you. God knows you. God loves you. I experienced a little bit of heaven last week as I met this handsome young man. My young man. It was a moment of SUDDEN GLORY. What about you? Would you like to be someone’s miracle today? Keep your eyes open to God’s direction, your ears attune to God’s gentle whisper, and your heart expectant to God’s tender tugs. I want to be someone’s miracle today… Thank you for reminding us of God’s infinite love! I want to be someone’s miracle today. I want to be someone’s miracle today. God Bless you. I told my family on January 1st.that this would be my year of miracles and since that day i have had miracles to take place. I dont do resolutions i just say things that usually come to pass like this is my year of miracles. I want to be someone’s prayer. I want to become someone’s miracle today. As I read this, tears rolled down, I remembered when FAWEU offered me a full bursary for my secondary education. I had not gone to school for a full term, and my school headteacher sent for me. I can imagine what that meant for the young man Miquel, god bless you Mrs Jaynes. Oh yes, i want to be someone miracle today. I want to be someone’s miracle today!! I want to be someones’ miracle today,everyday. I want to be someones miracle today. I am praying for my grandson, Ryan, and sending him an email of Bible verses. I want to be someone’s miracle today! I want to be someone’s miracle. I want to be someone’s miracle today. Thanks Sharon for releasing yourself to be used by God. I’m blessed to know you, and I’m encouraged to do more for God. God bless you. I want to be someone’s miracle, today! I want to someone’s miracle today! Thanks for the timely words, Sharon. Compassion gives me the opportunity to be someone’s miracle. I became the sponsor of a teenaged girl in Peru 3 years ago while visiting the other two children I sponsor there. She too had lost her sponsor. She is now enrolled in college! What a miracle for a child in poverty in Peru! Carol that is awesome. I pray that Miquel will go to college as well. Compassion gives them a vision that life can be different. Yes, I want to be someone’s miracle today. I am starting the process of possibly donating a kidney to along time friend and have been praying over it for quite a while. If this is God’s will, I pray He will let me be that miracle for my friend. I want to be someone’s miracle everyday! I want to be someone’s miracle today. Been touched by this devotion. I want more than anything to be the answer to someones prayer today. Tears are in my eyes. This story has so moved me. 20 years ago a young women getting ready to speak at a womens conf. For her first time went and walked through the room and prayed and asked God to give her just one seed from that day… I was that one seed…I was the answer to her prayer. I have been so touched…so stirred today…. Lord..please let me be the answer to someones prayer today…. I want to be someones miracle today. and it will be a year that I have been here. I have seen the needs of the people in this area. I want so much to help them all. I truly want to be a miracle to them. I want to be someone’s miracle today. Please Lord, send me someone to be a miracle to me today in Jesus Name , Amen. I want to be someone’s miracle today! :). – And I too have a child through Compassion!! His name is Peter and we have enjoyed corresponding for about 5-6 years!! What a joy. Would love to meet him someday!! Definitely in Heaven! :))) – Thank you, Sharon, for bringing me great encouragement through your blogs. Today you brought a tear and a smile! God Bless!?? I want to be someone’s miracle today and beyond. I want to be someone’s miracle today! What a compelling story.. I was touched. I want to be someone’s miracle today and every day! I want to be someone’s miracle today! I was so touched by your story! I want to be someone’s miracle today!!! I loved your story about your miracle young man. I am sponsoring 3 children as I have 3 grandchildren, and I want them to be aware of their friends “in the other country” as my 6 yr. old grandson Nicholas prays for his friend Nicollas in Peru. I am in hopes that my grandchildren and my 3 sponsored children “will grow up together.” We will send them paper items and stickers as that is all we are allowed to send, as I am sure you already know. I do want to sponsor an older boy sometime in the near future as I taught school for 31 yrs. (now retired), and I know that these older boys are often neglected in so many ways. I will be praying about the situation. I truly enjoy your posts! I WANT to be someone’s miracle today! I want my husband to fully experience God’s love!! To break the barriers of Satan and become fully alive and trusting in the glorious riches God has in store for him! Allelulia! Alleluia! Alleluia! Nothing is impossible with God!!!!!!! Praise God from whom ALL BLESSINGS truly FLOW! “I want to be someone’s miracle today.” I pray the Lord will use me to help someone and that I will be still to listen and wait for His tug..Thank you for sharing your story..I was moved with tears…. I want to be someone’s miracle everyday that God allows me to be. Thankyou so much for sharing. Brings me back memories of my short visit to El Salvadore withOperation Christmas Child 11 years ago. My group did visit the Compassion center. I shared my testimony and told the children about snow. After that our group leader had us see withour own eyes where some of the children live—right on top of a dump. We also we given the opportunity to distribute show boxes and lambs that played Jesus Loves Me to children in the hospital . I remember loving a liitle one who was on her way to join Jesus in Heaven that day. There was one little girl I could have easily swept into my arms to bring her home with me. FYI I have joined you in Praying for My Husband. 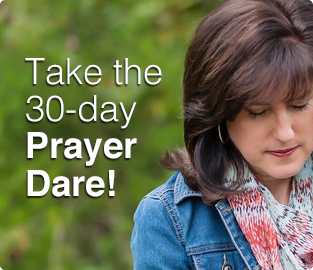 Going slower then the 30 day suggestion as I am also involved with Proverbs 31 Made to Crave. Just in case you are at P31 and run in to Sheila Ritchie . She is a dear friend of mine from our days working for BGEA in Minneapolis. I worked for BGEA for 26 years until God had change of plans for me. At the time I was still single. MOved home to be my moms caregiver in the last 6 years of her life as well made peace with my past. Then two months after MOm’s home going God knocked my socks off and surprised me with the loveof my life. We met online in August and engaged in Oct. and married just before Christmas. That was 5 years ago. We are now living in Maine looking for His directives for the next chapter He has in store for us. Some day you just may get to hear the longer version of our story. Unitl then God bless and thanks for your email sharings. I am struggling right now, as I know God is using me. I want God to use me and be that miracle in someone’s life. I am going through some hard financially times, but I know God can use me and my family to honor Him even through tough times. Please pray for me that God will show me what He would have for me to do so I can glorify His Holy Name. “I want to be someone’s miracle today.” Thank for reminding me of God pure LOVE. I want to be someone’s miracle today. I have been praying for God to show me where he is leading me. I sure do want to be someones miracle today and everyday.I want God to use me! I want to be someone’s miracle. Thank you God. Thank you for your wonderful story that inspired me to share my very first post today. May God Bless You for touching so many lives. Thank you so much for sharing this with us!! Yes, I want to be someone’s miracle today!! I want the Lord to use me to be someone’s miracle…I’ve had a rough year and a half, (divorced an unfaithful husband), long story…I decided this year, 2014, is going to be my year. God is going to work in & thru my life and teach me and use me and bless me & those He puts in my path…so far the devil has hit my family and friends. But satan knows I’m serious about letting God use me for His glory so he is trying to destroy our faith, (not going to happen. My God is greater)! 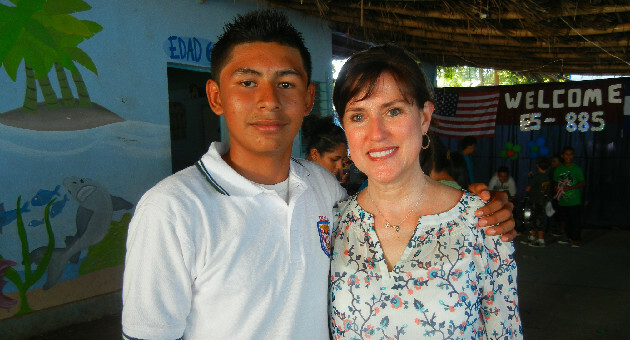 I just became a compassion sponsor last week for a 16 year old young man. He had been on the list needing a sponsor for 450 + days. My 9 year old daughter and I found him on the website after I heard about the need on a radio while I was traveling for work. The Christian radio station was the only station that came in clear, other than Latin music…. I feel it was as it was supposed to be, and I listened (which is a pretty new thing for me). I also heard about and ordered your book, Praying for your Husband from Head to Toe. It is such a great book. God is good! Hi Cathy! My Compassion young man turned 16 a few days ago! Where is your child? I am excited that YOU an answer to that young man’s prayer! I want to be someone miracle. I want God to use me. My prayer is that God will open my heart, eyes and ears to know his plan for me. Thank you Sharon for your inspiring story! My husband’s name is Victor and i am taking up the challenge, I did do the praying for awhile but stopped. I also want to be someone miracle. I want to be a miracle to someone today and soon! I have made the decision to volunteer to be a CASA (Court Appointed Special Advocate) for children. This is something God has been nudging me to do, so I am listening and “following” the nudge…. please pray for me and those I come in contact with.